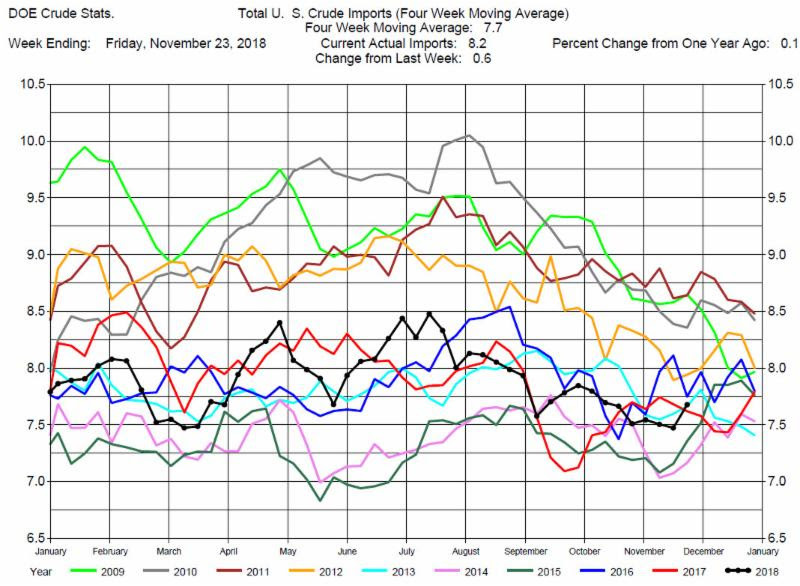 The DOE reported Total Crude Oil Inventories increased by 3.6 million barrels to 450.5 million barrels for the week ending November 23, 2018, while expectations average was for a 800,000 barrel increase. 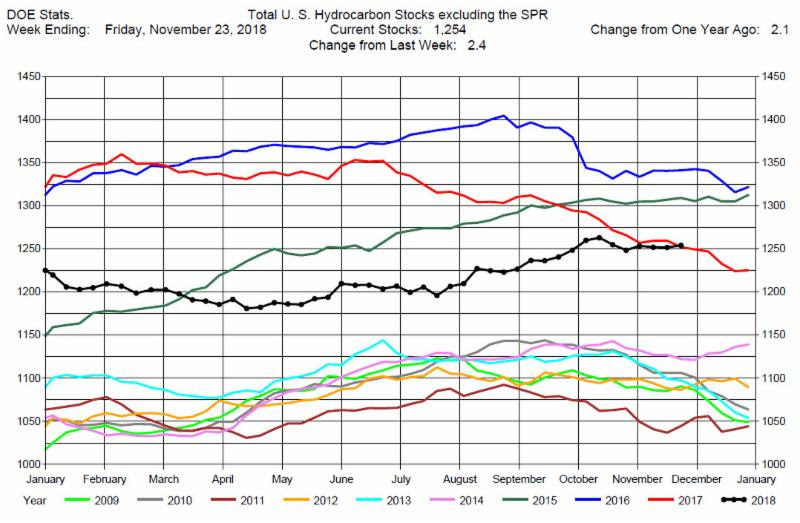 Overall hydrocarbon supplies increased by 2.4 million barrels to 1,254 million barrels. 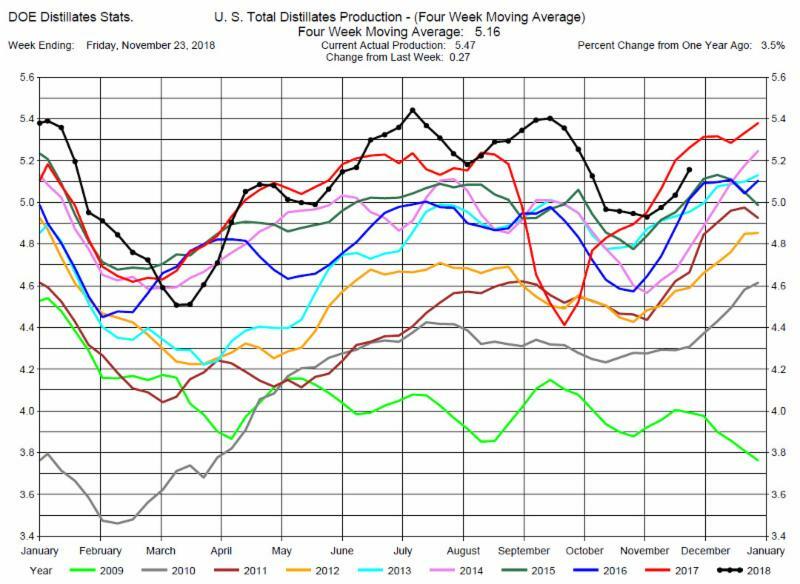 Crude Oil Production was unchanged at 11.7 million barrels per day. 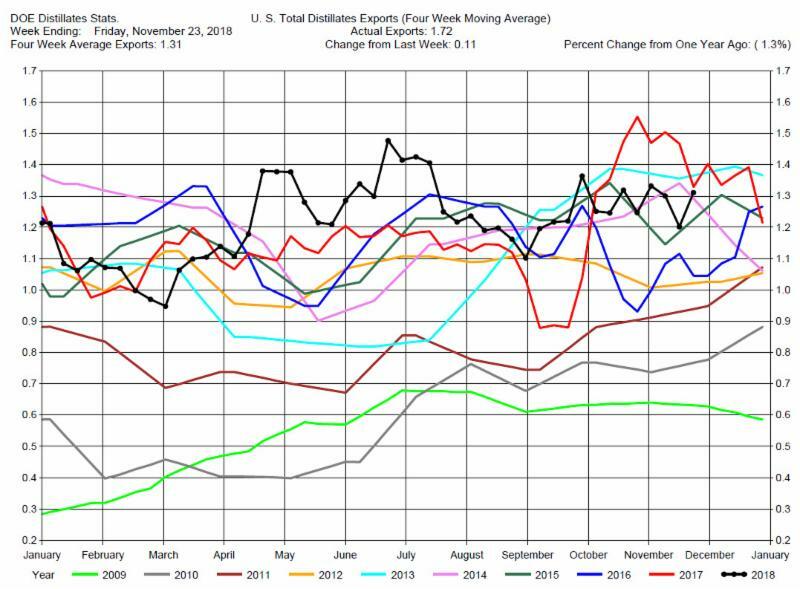 Total Crude Imports were up by 600,000 barrels per day to 8.2 million barrels per day. Total Refinery Crude Runs were up a large 700,000 barrels per day to 17.55 million barrels per day. 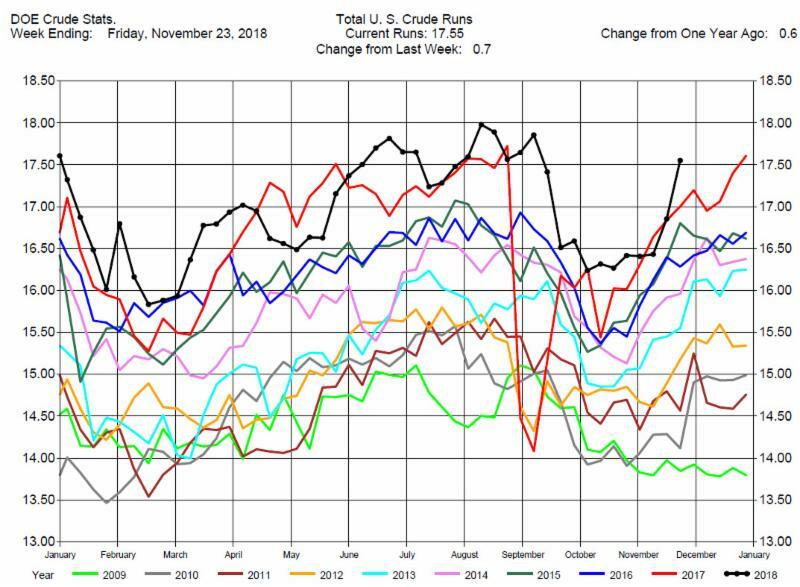 Refiners have completed the turn-around period. 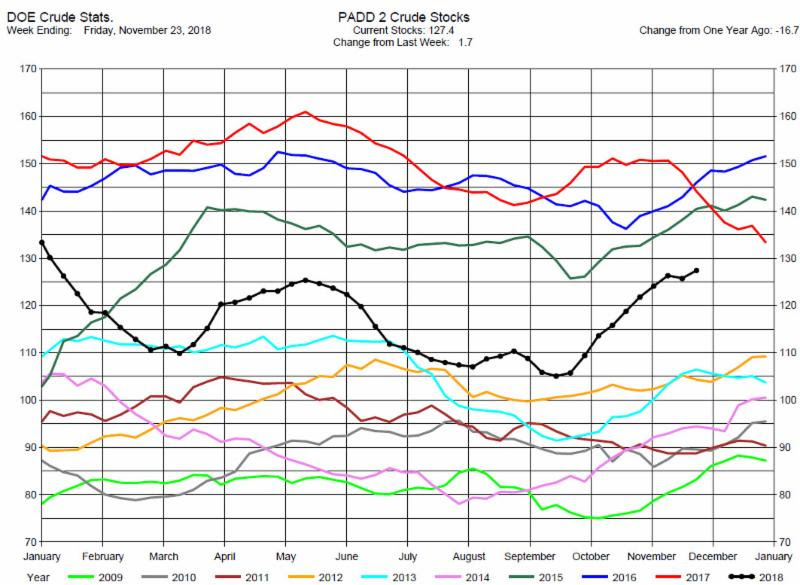 Following the release of the DOE report crude oil prices were volatile. The price range for the trading day was over $2 with a major down move at the end of the day. Prices were down by over $1 by the end of trading. 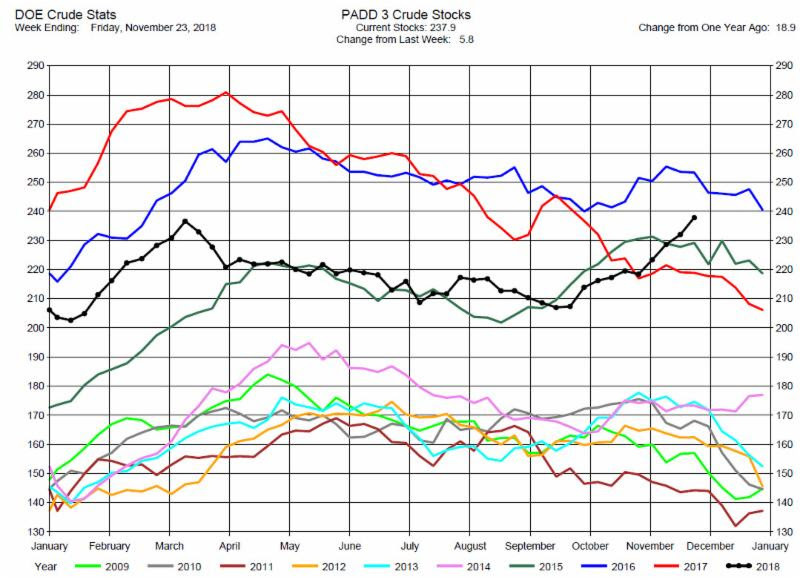 This is a bear market for crude oil. Whether it remains a bear market will be determined by how US shale oil production and Saudi Arabia respond to the fall in oil prices and whether the global economy slows further. With the increased volatility in the market we still recommend being on the sidelines. 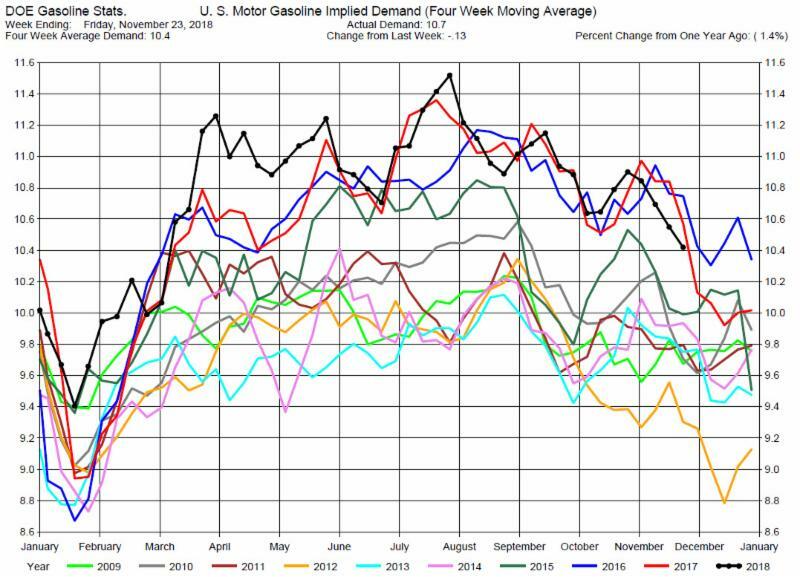 Implied Demand was down by 130,000 barrels per day to 10.70 million barrels per day. 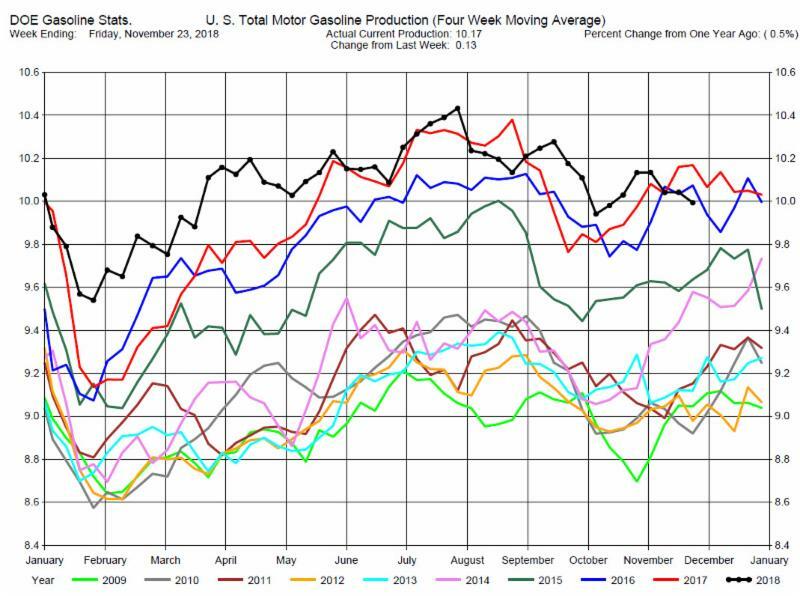 Gasoline Production was up by 130,000 barrels per day to 10.17 million barrels per day. 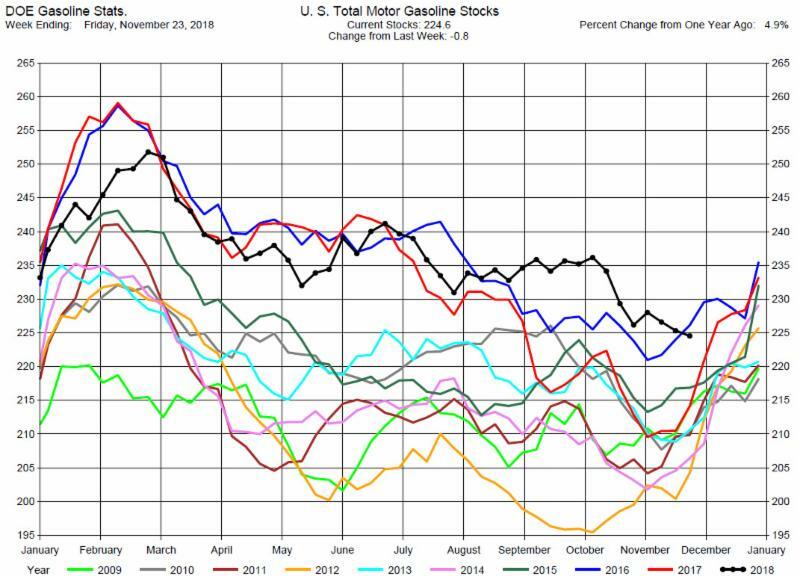 Gasoline stocks are plentiful for this time of the year and demand is decreasing so we recommend consideration of short positions, especially in the cracks. 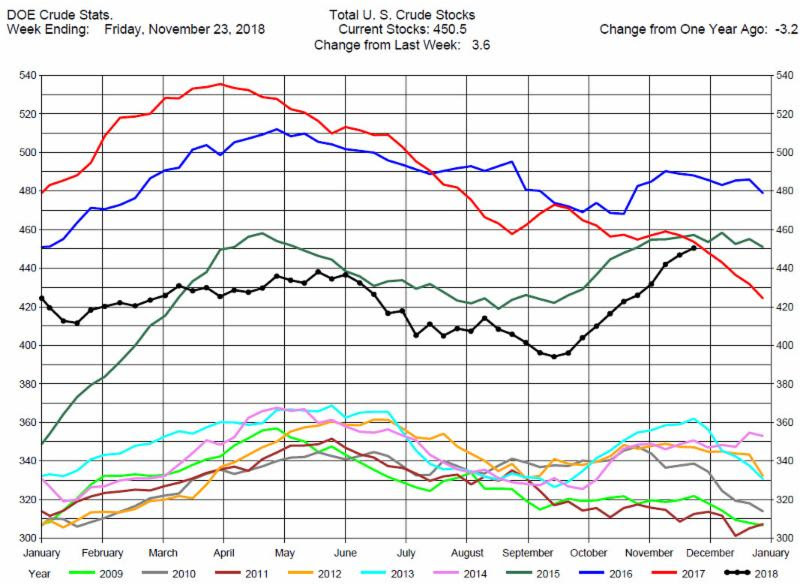 Total Distillates Stocks increased by 2.6 million barrels to 121.8 million barrels for the week ending November 23, 2018, while expectations average was for a 900,000 barrel draw. 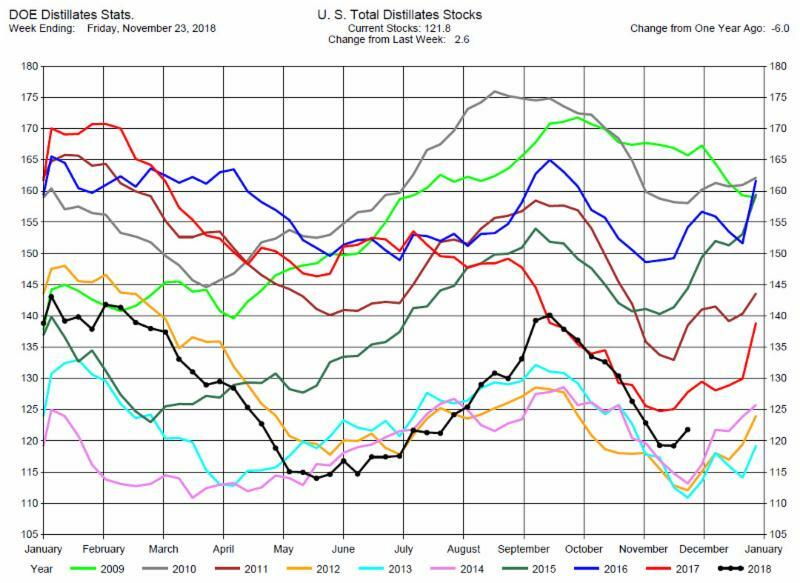 Total Distillates Production was up 270,000 barrels per day to 5.47 million barrels per day. 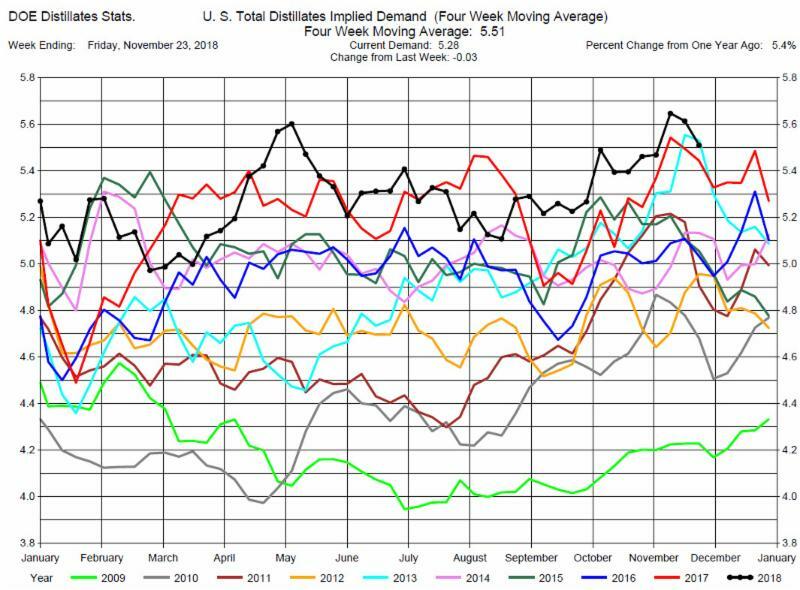 Total Distillates Implied Demand was down 30,00 barrels per day at 5.28 million barrels per day. 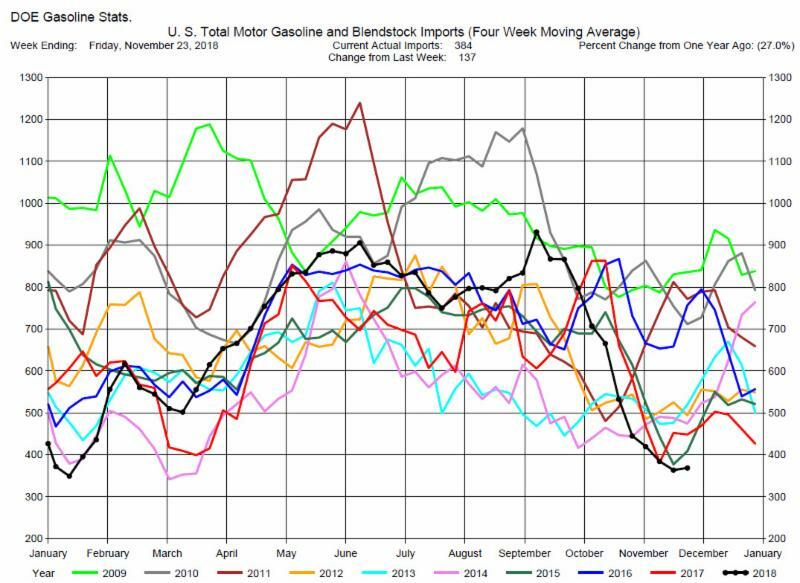 Distillates stocks are low and demand is at near record levels so we maintain our suggestion of consideration of long positions in the Heating Oil Cracks.